Stress reliever banana in the shape of er, well, a banana! 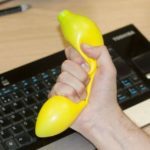 Super squishy – actually feels like a real banana without the mess. Perfect for stressful situations in the office or at home, so makes a great gift for exam-stressed students or workaholics. Follow the lead of the ultimate low maintenance survival Zen-master - the humble cactus plant! Sitting astride your desktop, shelf, or workspace, this noble plant will help ease your troubles just by being there when you need it most.